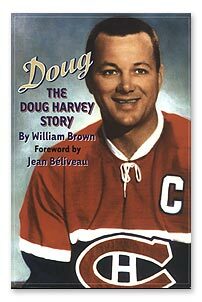 Doug Harvey's Hall of Fame career began during the era of the Original Six hockey teams and ended in the early days of NHL expansion two decades later. Born in Montreal's West End, he turned down careers in football and baseball to become one of the greatest hockey players ever. A perennial all-star and seven-time winner of the Norris Trophy for best defence-man, he was a cornerstone of the legendary Montreal Canadiens that won five Stanley Cups in a row. Harvey's brilliant passing set the devastating Montreal attack in motion, and his consummate puck control kept the other team from scoring. Off the ice, Harvey was a rebel. He was a driving force behind an attempted players union and an outspoken critic of the hockey establishment. He was funny, irreverent, generous, and kind-hearted. He was also stubborn, hard drinking, and unpredictable. Team mates considered him a leader and friend. Management considered him a trouble-maker. Life after hockey was difficult. He battled alcoholism and manic-depression. He led a nomadic life that often worried friends and family. But he returned to the Canadiens as a scout in 1985 and was happy to be back. Many called him a tragic figure, especially after he became fatally ill with liver disease. But Harvey had no complaints. He wouldn't have changed a single day of his remarkable life. William Brown is a free-lance writer and broadcaster. His previous books, The Montreal Maroons: The Forgotten Stanley Cup Champions, and Baseball's Fabulous Montreal Royals, chronicled two cherished sports teams from the city's past. William Brown is a free-lance writer and broadcaster. His previous books, The Montreal Maroons: The Forgotten Stanley Cup Champions, and Baseball's Fabulous Montreal Royals, chronicled two cherished sports teams from the city's past.